Sometimes we can’t help but wonder if Mother Nature specifically designed some places just for Instagram. We kid, we kid…but only kind of. Especially when we come across incredible natural formations like the Rainbow Mountains in Peru. These multicolored, striped formations might look more like a pack of Fruit Stripe than a mountain, but we assure you, they’re very much a real destination. 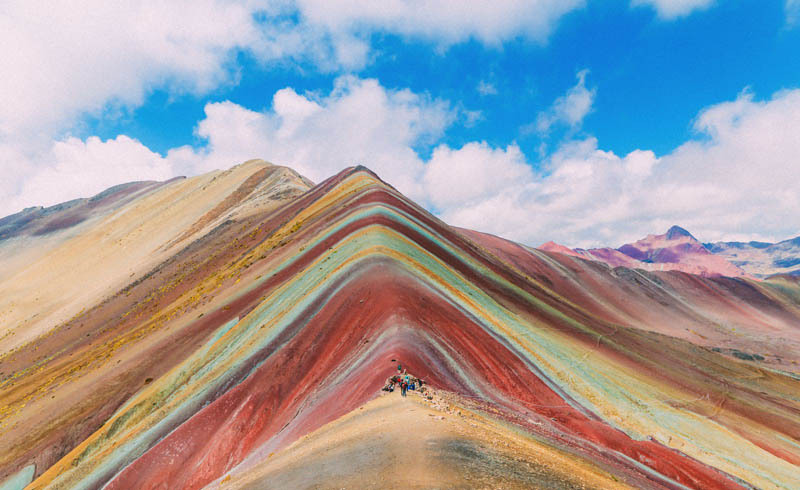 Their actual name is Vinicunca and we’re adding them to our travel bucket list ASAP. Here’s everything to know about this natural wonder. What makes the mountains so colorful? 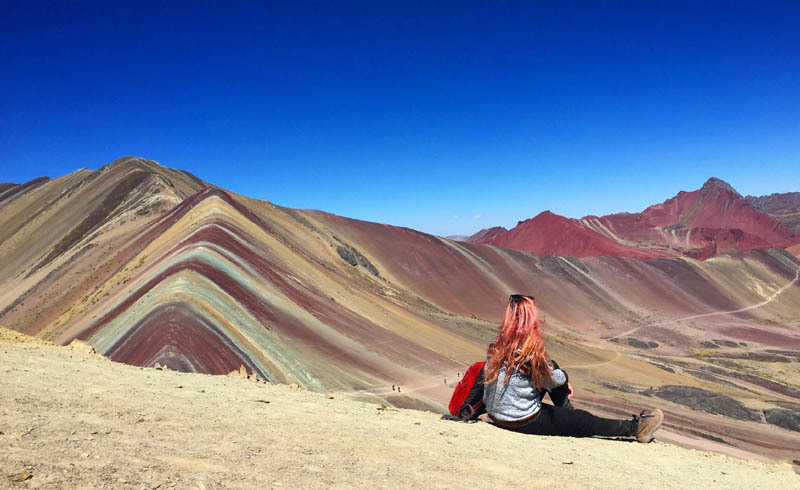 As the ice that used to cover the Vinicunca melted and the ground continued to erode, different mineral layers were exposed leaving a series of multicolored stripes along the ridge. The red comes from oxidized iron (aka rust), the yellow is due to the presence of iron sulphide, the purple-ish brown comes from goethite or oxidized limonite, and chlorite is what causes the varying shade of green (not vegetation). How does one get there? First, you have to get to Cusco by grabbing a connecting flight from Peru's capital city, Lima. From there, the trailhead is a three-hour drive via bus (about $30 per person). To get to the most impressive lookout point, you’ll have to hike a trail that's just under six miles round-trip. Heads up: The whole one-day thing requires a very early start time (like 3:30 a.m. kind of early), but the views are seriously worth the still-dark alarm. Sounds like a lot of work. Are they really that bright? The weather plays a major factor in determining just how vibrant your view will be, but on a bright, clear day the mountains really do look like a solid wavy rainbow. And although the altitude can be a challenging factor for some hikers, spending a few days in Cusco before you visit the mountains will help you adjust much quicker.